An oxygen hood is a plastic dome or box with warmed and humidified oxygen inside. 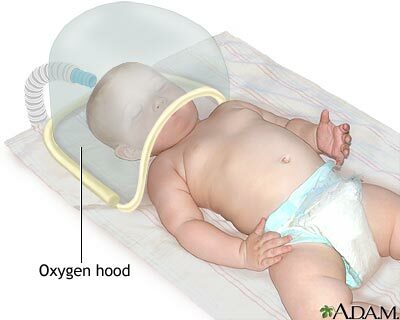 The oxygen hood is used for babies who can breathe on their own but still need extra oxygen. Reviewed By: Kimberly G. Lee, MD, MSc, IBCLC, Clinical Professor of Pediatrics, Division of Neonatology, Medical University of South Carolina, Charleston, SC. Review provided by VeriMed Healthcare Network. Also reviewed by David Zieve, MD, MHA, Medical Director, Brenda Conaway, Editorial Director, and the A.D.A.M. Editorial team.